The much talked about poster of Tumhari Sulu (attached) has made its way to Vidya Balan’s wall as an oil painting. 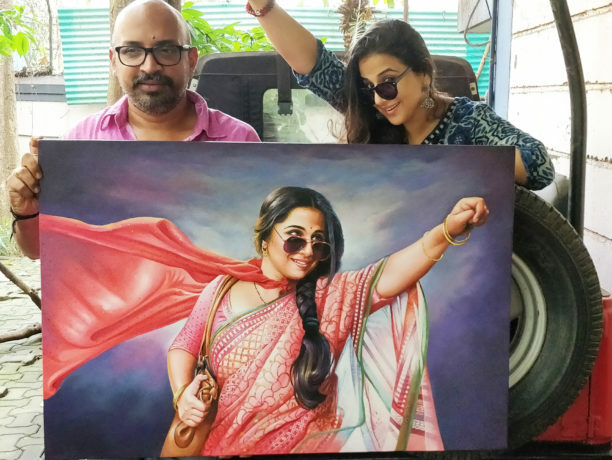 Noted ad filmmaker and director Suresh Triveni got one of Bollywood’s oldest poster artists, Laxman Subhash Jadhav, to make an oil painting of the poster and gifted it to his “favourite actress” to adorn her home wall. Produced by T-Series and Ellipsis Entertainment, Tumhari Sulu comes from the producers of Neerja and Hindi Medium, and releases worldwide on November 24.